Now Archived! PolarConnect event with Lauren Adamo Neitzke and the research team on Sliding Glaciers from an overlook of the Rhone glacier in Switzerland on Thursday, 23 August 2018. You can access this and other events on the PolarConnect Archives site. 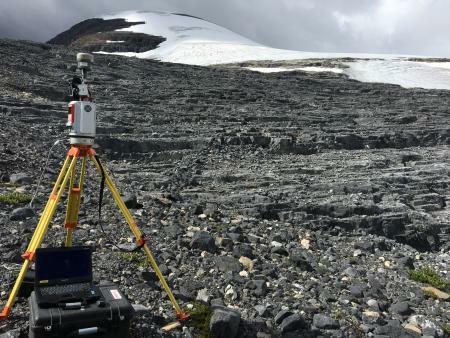 The forefield of Castleguard Glacier, Alberta, Canada, where the team made its first measurements using the terrestrial laser scanner in the foreground. Photo by Keith Williams The team is developing mathematical relationships needed to predict the sliding speeds of glaciers and ice sheets. The uncertainty of these relationships, called sliding laws, introduces major uncertainty in the results of computer models aimed at predicting ice-sheet flow and associated sea-level rise. Improved sliding laws are developed by visiting forefields of seven receding glaciers in the Swiss Alps and measuring in detail the topography of their exposed former beds. This topography is then used as the basis for computer models of glacier sliding that allow sliding laws to be derived. The field site is not in a polar region but the team's work can help predict glacial change that may occur at the poles in the future. 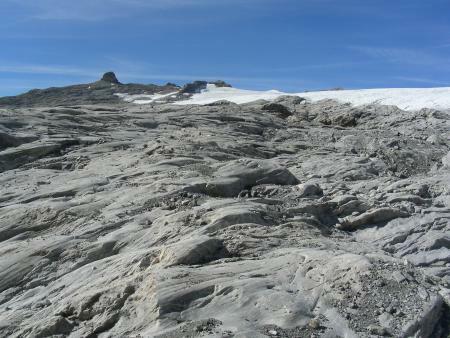 The forefield of Tsanfleuron, one of glaciers where the team will be working. Lecture presented by Dr. Lucas Zoet at the Rutgers Geology Museum Open House on 01/26/2019 as part of the Sliding Glaciers PolarTREC project. Rutgers Today daily online news features educator Lauren Neitzke Adamo and her PolarTREC expedition to the Swiss Alps. Museum Co-Director Lauren N. Adamo is off to the Swiss Alps! The Rutgers Geology Museum publication "Mastodon Musings" tells about the Museum Director's PolarTREC expedition in the Swiss Alps. PolarTREC teacher and Rutgers University Geology Museum Director, Dr. Lauren Neitzke Adamo featured in a news release in Rutgers Today and EOAS Website. Article about Dr. Lauren Neitzke Adamo, co-director of the Rutgers University Geology Museum, and her upcoming expedition through PolarTREC, in the Swiss Alps to study the impact on glacier melting. Project Funded Title: Collaborative research: Development of sliding laws for glacier-flow and landscape-evolution models. Lauren Neitzke Adamo's interest in science and geology started at a young age while traveling to National Parks all over the country with her family. This love was further fostered while earning her undergraduate and doctorate degrees in Geological Sciences at Rutgers University, where her research focused on understanding the mechanisms and underlying causes of the abrupt climate change observed in sediment cores from North Atlantic Ocean over the last 200,000 years. She also spent much of her graduate career teaching science and geology to a variety of formal and informal audiences and was thrilled to accept a position at the Rutgers Geology Museum as the Associate Director in 2009 and as the Museum Director in 2016. This position allows her to combine her love of teaching, science, research, and dinosaurs through the implementation of various educational activities and programming for the Rutgers and New Jersey communities. Lucas (Luke) Zoet is an Assistant Professor in the Department of Geoscience, and holds an appointment in Geological Engineering at the University of Wisconsin-Madison. His research largely focuses on understanding the physics of glacier motion through field observation, laboratory experiments, and theoretical analysis. His work largely sits at the intersection of glaciology and glacial geology. He uses a variety of geophysical and geological methods to explore glacial processes at both modern-day glaciers and landforms left behind by since melted glaciers. Thanks Hannah, yes it has been a lot of fun. But also a lot of hard work. Your expedition sounds amazing. What an exciting experience it must be working with those scientist up in the Alps.